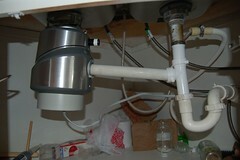 So I took on my first big homeowner project this weekend - installing a new Garbage Disposal to replace our old dead one. Apparently the old disposal objected to having to process two bottle caps. Go figure. And No More Bottle Caps for YOU!